Game description: Fans can once again whip out their Gibson-shaped SG guitar controllers and shred to their favorite rock tracks. PS2-exclusive Guitar Hero: Rocks the 80s features retro rock venues and hipster characters, unlockable guitars, intense game play modes, and most importantly 30 awesome new songs to experience the ultimate rock star fantasy. Rocks the 80s is an incremental title in the Guitar Hero series, rather than a full sequel. No changes in gameplay from Guitar Hero II have been introduced to this game. As implied by the game's title, the game features a 1980s theme, consisting of songs from the decade and playable characters, fashions, and artwork that reflect the time period. 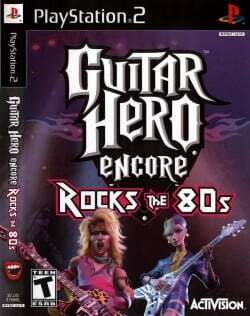 Rocks the 80s is the third and final title in the Guitar Hero series to be developed by Harmonix before they moved on to create Rock Band.